The main giveaway thread currently has 48 50+ entries - at 50, I'll add a 2nd PDF copy of OpenQuest 2 into the prize pool. You need to add yourself to the original thread to be counted and entered. As I've said many a time at The Tavern, monies raised from affiliate sales are the community's money, and I like to return it in fun ways - either through contests like this or to review products I wouldn't otherwise have access to. Kickstarter Updates For the OSR - The Lost Red Box of Dwimmermount Whispers "OpenQuest..."
I'm actually afraid to see where some of my Kickstarter projects actually are along the fulfillment ladder. Maybe I'll tackle that later on this 4 day weekend of mine. Instead, I'm looking at some OSR Kickstarters. Some long overdue and some stlll accepting backers. Lets take some short peeks, shall we? The Lost Lands: Sword of Air is Frog God Games' setting Kickstarter for S&W and Pathfinder. It has funded and is currently at 383 backers. At 400 backers, Swords & Wizardry Complete goes free in PDF - this is the full art current version. So, backers get to give a gift back to the gaming community as a whole - pretty cool. It also just hit it's first stretch goal at $85k. 13 days left in this one. 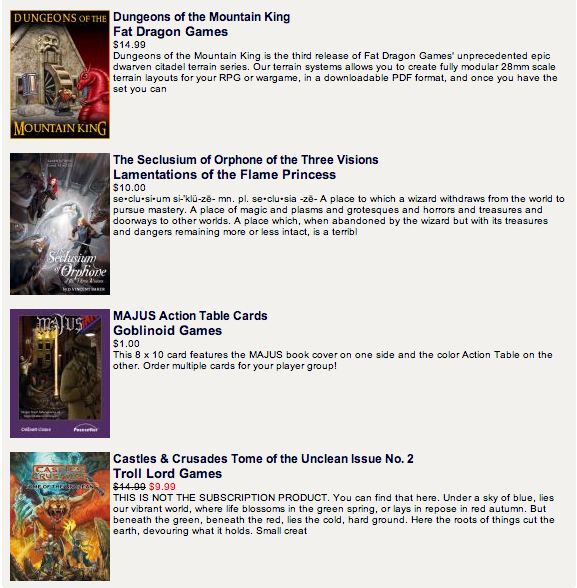 Adventures in the East Mark: The Red Box is an amazing value for an OSR starter set. $30 gets you a boxes set with dice. The art is amazing, but if you want it in color, it will cost your $60. Dwimmermount - another update- another update that I barely skimmed. No ship date yet. 15 months late and the curse seems to be still in effect. Whispers & Venom Boxed set - on pace to ship at the end of November and on time. I'm really glad I backed this one. Between now and the morning of November 5th (Tuesday) you can give yourself a chance to win a PDF copy of OpenQuest 2, the new revision to OpenQuest. All you need to do is make a comment on this post and come Tuesday morning (my wife and I's 2nd wedding anniversary) and you'll be entered to win a copy of OpenQuest 2 in PDF. One random winner will be awarded the prize using account credit at RPGNow. Kinda like my anniversary gift back to the community here at the Tavern. Why OpenQuest 2? Because I really like the first edition, and to my sensibilities, it is what the modern version of RuneQuest should have been. After D&D / OSR rules, my picks would be Tunnels & Trolls and RuneQuest 2nd edition for old style play. OpenQuest 2 brings out the RQ2 feel for me. 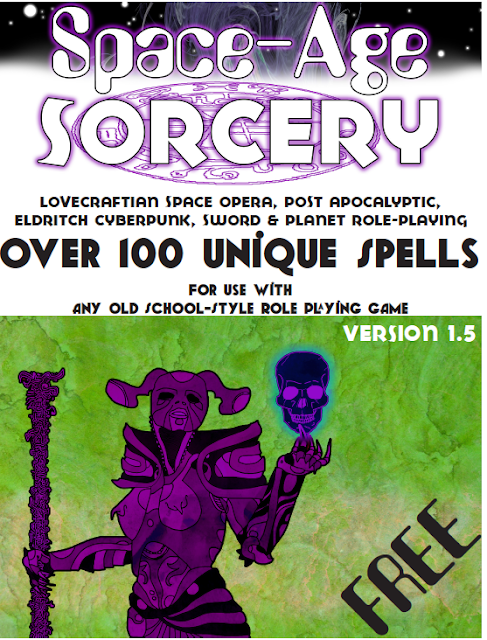 A complete and easy to play Fantasy Roleplaying game, with monsters, magic and exotic locales. OpenQuest uses the classic D100 rules mechanic, which uses percentages to express the chance of success or failure. This is the 2nd Edition of the game in full colour with 80 new pages of content. The Deluxe version of the game aims to be a self contained game with rules and advice on how to run a full campaign where the adventurers progress from their poor and ill experienced beginnings to the lofty heights of Godhood! Open Quest is based on the Mongoose RuneQuest SRD (MRQ SRD), with ideas from previous editions of Chaosium's RuneQuest and Stormbringer 5th, mixed in with some common sense house rulings from the author's twenty years of experience with the D100 system. So, what shall we spend out savings on? Come on! Give us some ideas! Back in the way back (mid April of 2013) there was a day unlike any other. That day was Swords & Wizardry Appreciation Day. Much goodness was had that day, and one of the things that sprung forth was an awesome article by one +Dak Ultimak about Firearms in Swords & Wizardry. +Dak Ultimak has now put that in finalized form as a Print / PDF supplement for Swords & Wizardry. If you have ever read an issue of Crawl! 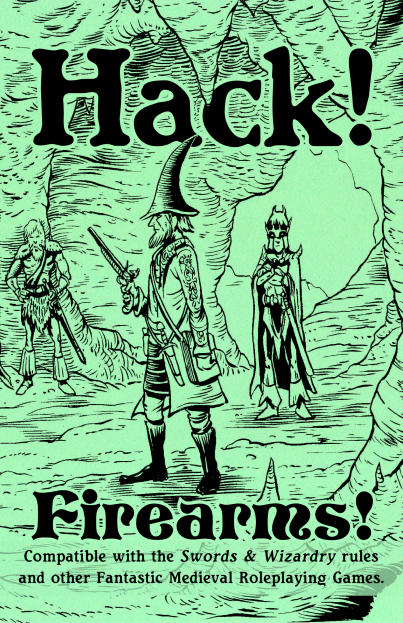 for the DCC RPG, you know that Dak puts together an amazing zine, and I expect no less from Hack! The PDF is PWYW and the Print / PDF Combo is $3.50 - shipped! You can't beat either price. Through November 3rd, OBS / DriveThruRPG is running a "find the pumpkins and you get free swag" promo for the Halloween season. I've found Savage Worlds Horror Companion thus far (follow the link and click on the pumpkin for the free loot). Are You Late to Crawl!? Crawl! Zine Now Available in a Colorful Bundle! 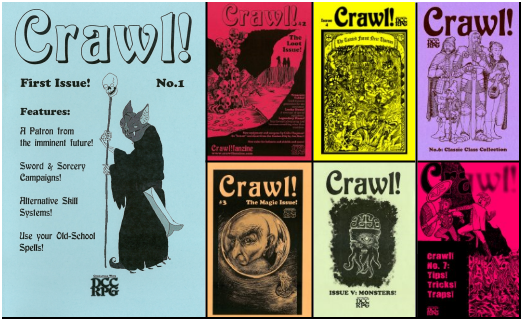 +Dak Ultimak has back issues of Crawl! available in a bundle pack. If you have somehow missed out on Crawl! in the past, it's an excellent way to catch up. 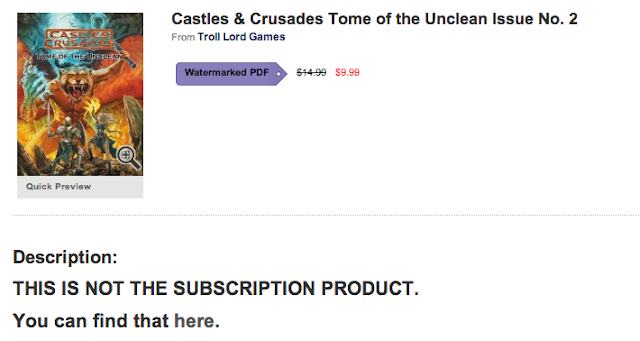 Sure, it's for the DCC RPG, and you might say "is it of any use if I don't play DCC?" The ideas themselves are often priceless, and I'll be yoking stuff from back issues of Crawl! to liven up my new Swords & Wizardry campaign. Crawl! is one of the best RPG zines out there - if not the best (the competition is damn tight for "the best"). Are There Any "Legit" Old School / OSR Horror Settings? Ravenloft was NOT a horror setting, no matter the trappings. It was more of a "horror fun house". Tainted Lands for C&C looks like Ravenloft with a different set of paints. Midnight (for 3e) is a dark setting, not horror. Is there a horror setting for Old School gaming that I've missed? I hated sharing my G+ link that led to me, as it was a huge jumble of numbers. I've always wanted to check out Trail of Cthulhu. Sure, it's only the Player's Guide, but it should be enough to let me know of the system is for me. The Cubicle 7 CoC books always tempted me in the past, are there are two in this collection. About $15 bucks gets you everything pictured and no watermarks dirtying up your PDFs. Now, I thought for a sec that maybe this was supposed to be a special link that they might give out to reviewers, but it's in the rotation on the RPGNow homepage. I almost thought I wasn't going to get a copy. That is, until Tom posted my full name and tracking info in the comments section of the Myth & Magic Kickstarter. Safe to guess my persistent badgering got under his skin. I'm also fairly sure that without the vocal complaints of numerous backers in the comments section of said Kickstarter, we'd still be waiting on delivery. That being said, its a pretty book. The cover has a nice grip to it and the pages seem to be of a high quality paper. I'd guess and say NHG made little if any profit after shipping these books. Which is a shame. 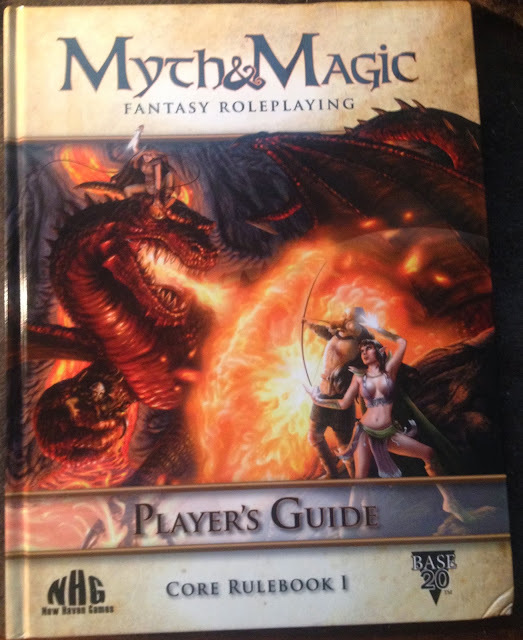 The PDF showed Myth & Magic to be a damn decent reimagined presentation of the 2e rules and the print copy is an excellent companion to the PDF. I'm just not sure how well Tom is going to be able to regain the faith of a sizeable portion of those that backed this Kickstarter. Poor communication in a Kickstarter is bad. Outright "misstatements of truth" hurts credibility, and Tom had some whoppers in various updates. So, excellent game design and presentation, piss poor customer service and management on the business side of things. All in all, not a huge surprise for this hobby of ours. The first time I noticed "At Cost" print options as a reward in a Kickstarter was the Lords of Gossamer and Shadow: Diceless Role-Playing campaign. Steve Russell, the main man behind Rite Publishing, has been doing crowd sourced projects from a time before Kickstarter became the engine for funding. I loved the Amber RPG, even if I only played it in a short, email run campaign years ago, so it was a no brainer that I would support a Kickstarter that was bring the rules for that game back into print. Until I saw the "At Cost Print on Demand" in the rewards section of the Kickstarter. In truth, it pissed me off initially, as it meant that my pledge / support / backer cash that I was Kicking in WASN'T going to actually give me a "prize in hand" without further expenditure (not counting the PDF that is). In the end, I recognized it as pure genius. With "At Cost Print on Demand", some schlep who can't keep his finances in order to actually pay for print copies, or just as bad, pays for print copies but never ships them because of the latest excuse of the day, isn't the one holding things up. When it's ready to "print", you get your link or code to OBS, pay the "at cost" price plus shipping and you get it shortly thereafter. Instead of shipping to someone's apartment and then shipping from there across the world, in dribs and drabs as one sneaks out to the post office between real world responsibilities, it's just a single shipment from the Print on Demand source. International shipping? The project creator isn't at the mercy of increasing postal rates. OBS' PoD partner prints in Europe and Australia if I'm not mistaken, again keeping down costs (and removing the dreaded "International backers please add $30 US for shipping). Amethyst - Fantasy & Technology Collide is another Kickstarter that is going the "At Cost PoD" for backers, which allows one to get all of the rewards for $40 in PDF and print copies of the products one wants in print at cost. Taking shipping out of the hands of creators can be an excellent business decision, as more often than not, creative types make for horrible business types. Not everyone can be good at both. The danger lies with the back tho'. One has to remember the final cost will include the price to print and ship. Still, it's a better option than waiting on a "Wandering Wizard" or looking at photos of boxes piled in someone's living room waiting for the shipping fairies to come and take them away. Now we just need to get project creators to stop with the t-shirts, tankards, usb keys and all of the other extraneous chotskies that are used to drive up pledge amount totals but do nothing but drain money, time and effort from the project. One can hope, right? There is something special about DCC RPG adventures - there is usually a really strong story to each of them, and each adventure generally stands on it's own. Prince Charming, Reanimator is definitely special, it has a strong story and hook and if successful, may not need to stand on it's own. 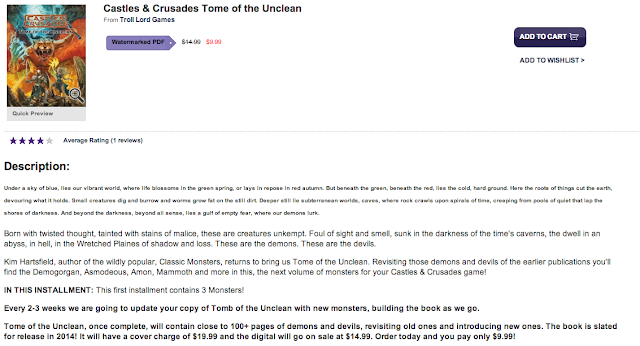 It's also the first "Pay What You Want" release for the DCC RPG that I can think of. It's funny - I think I've gotten to the point where I can recognize a +Harley Stroh , +Michael Curtis or +Daniel Bishop DCC adventure just from reading the opening text. They are each strong storytellers and each has their own style. Prince Charming, Reanimator is certainly in +Daniel Bishop 's style. I love the re-imagining of the classic fairytale, and the multiple ending options IS the way to write an adventure of this type. It is very much an Appendix N style adventure. Prince Hubert Charming, son of the Baron of Westlake, and heir to Westlake Manor, is well known as a cold man, whose watery blue eyes seem to betray no emotion at all. Yet he is a great lover of beauty, as all his wives have proven. The first he found working in the cinders of a woodsman’s cottage. Some say that the girl’s jealous stepsisters threw her down a well to prevent her from becoming the young prince’s bride, but even death did not bar Prince Charming, and she enchanted everyone at the wedding. Her stepsisters were placed in spiked barrels filled with hot coals and dragged through the town until they themselves died. Whatever process Prince Charming used to revive his bride, it did not last forever. All too soon, the Princess Ella took ill and died. when Prince Charming injected his magic elixir and kissed her upon the lips, her eyelids fluttered open and she breathed again! The story was told that the new Princess had been in but a deep coma, a sham of death, until a poisoned apple was dislodged by the Prince’s kiss. But folk began to whisper in dread, and none were surprised when it was announced that Princess Snow, like Princess Ella, succumbed to a fatal illness after only a few years of marital bliss. In all kingdoms there are tales, and in the Barony of Westlake, it is said that the Grimmswood hides the ruins of a long-lost realm. The daughter of its final king, cursed by a malevolent faerie, pricked her finger on a spindle upon her sixteenth birthday, in the blossom of her youth, and died. With her death, the kingdom went to ruin. Few now dare to go far into the Grimmswood, although the riches of the lost kingdom are said to lie unclaimed within. Fear of dark fey magic and even greater evils keep men out. Or they did so until now. For Prince Hubert Charming of Westlake has determined that the long-dead Princess Beauty is only cursed to sleep away the aeons, and he will have her for his bride. His men rounded up a stable of “volunteers” at the beginning of one early autumn morning, and here you are, with what makeshift arms and equipment you had upon you when you were “volunteered”. Your mission, the Prince’s Bailiff explains, is to enter the ruined castle, find the place where the “Sleeping” Beauty lies, and bring her forth for Prince Charming to restore with a kiss. Those who choose not to go upon this quest must take their chances with the Prince’s Guard, twenty men strong, and be declared outlaw. Those who choose to hazard their lives within the ruined castle may keep what they find, apart from the sleeping princess, but dare not leave without her. I'm sure I've forgotten to mention this, but there are some awesome (and free) OSR resources over at the Hereticwerks Blog. I'l try to highlight them over the next few weeks, just in case you've failed to find the blog on your own (it's on my blogroll). Today, I'm highlighting Space-Age Sorcery. 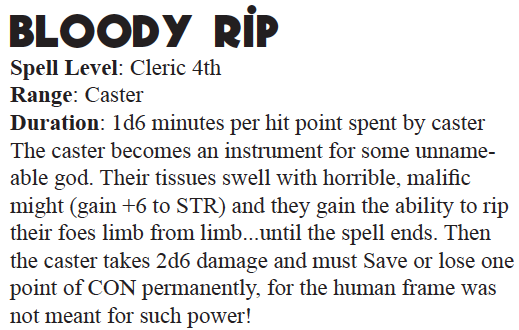 It's a bunch of new spells for casters (in this case, using the S&W format, be usable with the OSR ruleset of your choice. It is a collection of mostly bizarre and Lovecraftian style spells. It really is an awesome menu to choose from when trying to make your BBEG different and disturbing. I'm willing to go so far as to say they would work equally well in the DCC RPG as a resource of NPC spells. I mentioned it's FREE, right? The world needs a hero. Unfortunately, there aren't any, so what the hell, you might as well give it a try. You're a Disciple, a supernatural warrior on the front lines. Wielding bizarre magics like Sexpletive, Death Panel, Photobomb, and Gunfetti, you must hunt down the diabolical and divine, rescue innocent civilians, and maintain a grip on the tattered vestiges of your humanity. How far will you go to destroy your enemy? Will you resort to cannibalism? Are you certain? Listen, don't knock it until you've tried it. This game is an amalgam of two previously-published RPGs. Dread: The First Book of Pandemonium was originally published in 2002, with a new version in 2007. Spite: The Second Book of Pandemonium was released in 2009. Pandemonio combines both rulesets and settings into a fast-paced game of splatterpunk action set in a world of violence and decay. You'll need several 12-sided dice and a mind full of nailbombs, scaphism, and hollow-point bullets.